I’m very happy to have been listed as a vExpert for 2019. This is the seventh time that they’ve forgotten to delete my name from the list (if you think I’ll ever give up on that joke you are sadly mistaken). Read about it here, and more news about this year’s programme is coming shortly. Thanks again to Corey Romero and the rest of the VMware Social Media & Community Team for making this kind of thing happen. And thanks also to the vExpert community for being such a great community to be part of. I’m very happy to have been listed as a vExpert for 2018. This is the sixth time that they’ve forgotten to delete my name from the list (literally never getting tired of that joke). Read about it here, and more news about this year’s programme is coming shortly. Thanks again to Corey Romero and the rest of the VMware Social Media & Community Team for making this kind of thing happen. And thanks also to the vExpert community for being, well, such a great community to be part of. I’m very happy to have been listed as a vExpert for 2017. This is the fifth year in a row that they’ve forgotten to delete my name off the list (literally never getting tired of that joke). The announcement and list is here, and more news about this year’s programme is coming shortly. Thanks again to Corey Romero and the rest of the VMware Social Media & Community Team for making this kind of thing happen. And thanks also to the vExpert community for being, well, such a top community to be part of. I’m really quite pleased to have been listed as a vExpert for 2016. This is the fourth year in a row that they’ve forgotten to delete my name off the list (still not tired of that joke). The announcement and list is here, and more news about this year’s programme is coming shortly. Thanks again to Corey Romero and the rest of the VMware Community people for making this kind of thing happen. And thanks also to the vExpert community for being, well, such a great community to be part of. I waffled on some time ago about using proper certificates in your vSphere 5.5 environment. You can read about some of how to do that here. Eric has a nice summary of the steps here. I got a call recently from the customer about a few things and they mentioned some issues with vSphere Replication 5.8. Turns out I’d forgotten about vSphere Replication when I’d gone through the certificate replacement process, as it was done as a PoC. The fix is simple: power off the appliance and power it on again. VMware has a KB for most every situation, including this one – VMware vSphere Replication appliance no longer able to communicate with the VMware vCenter Server after changing the vCenter certificates (2063955). It also helps that I’m a bit late to this particular party. The next step should be to replace the certificates on your vSphere Replication infrastructure as well. I was going to put together a post on that too, but it’s probably simplest if you read the VMware KB – Configuring CA Signed Certificates for VMware vSphere Replication (2080395). Friedrich also has a great post on some of the basics – including the certificate replacement process – here. In a previous post I talked about deploying custom SSL certs into a vCenter 5.5 environment. As I was working through the update steps, the Certificate Automation Tool kept bombing out when updating the Inventory Service certificate. Neither the client nor I really knew why this was happening, but I had a bit of a hunch that it something to do with SSO credentials. It turned out to be a lucky guess, as I reset the password a few times and the SSL cert tool started working. If you find yourself in this situation, there’s a tool provided with vCenter to reset the SSO password. Here’s a link to the KB article. At times I wasn’t convinced that this list is comprehensive either. I’ve come across a few slightly odd things that I hadn’t accounted for during a recent vSphere 5.5 U2 deployment and thought it would be handy to document them. In this post (which is hopefully the last one) I’d like to cover off SSL certificates. A lot of people don’t bother trying to deploy custom certificates because it invariably involves interaction with an in-house InfoSec team. This can be a royal pain in the arse. I understand completely. That said, getting custom certs into your vSphere environment has become a lot easier in recent times. And here’s what the Update Steps Planner gives you to work through. 1. Go to the machine with Single Sign-On installed and - Update the Single Sign-On SSL certificate. 2. Go to the machine with Inventory Service installed and - Update Inventory Service trust to Single Sign-On. 3. Go to the machine with Inventory Service installed and - Update the Inventory Service SSL certificate. 4. Go to the machine with vCenter Server installed and - Update vCenter Server trust to Single Sign-On. 5. Go to the machine with vCenter Server installed and - Update the vCenter Server SSL certificate. 6. Go to the machine with vCenter Server installed and - Update vCenter Server trust to Inventory Service. 7. Go to the machine with Inventory Service installed and - Update the Inventory Service trust to vCenter Server. 8. Go to the machine with vCenter Orchestrator installed and - Update vCenter Orchestrator trust to Single Sign-On. 9. Go to the machine with vCenter Orchestrator installed and - Update vCenter Orchestrator trust to vCenter Server. 10. Go to the machine with vCenter Orchestrator installed and - Update the vCenter Orchestrator SSL certificate. 11. Go to the machine with vSphere Web Client installed and - Update vSphere Web Client trust to Single Sign-On. 12. Go to the machine with vSphere Web Client installed and - Update vSphere Web Client trust to Inventory Service. 13. Go to the machine with vSphere Web Client installed and - Update vSphere Web Client trust to vCenter Server. 14. Go to the machine with vSphere Web Client installed and - Update the vSphere Web Client SSL certificate. 15. Go to the machine with Log Browser installed and - Update the Log Browser trust to Single Sign-On. 16. Go to the machine with Log Browser installed and - Update the Log Browser SSL certificate. 17. Go to the machine with vSphere Update Manager installed and - Update the vSphere Update Manager SSL certificate. 18. Go to the machine with vSphere Update Manager installed and - Update vSphere Update Manager trust to vCenter Server. And then you have a nice list of stuff to work through. I’m not going to dump the whole process here, but here’s a grab of what updating your vCenter cert looks like. [Thu 28/05/2015 - 10:39:54.86]: The services that are restarted as a part of this operation are: VMware VirtualCenter Server, VMware VirtualCenter Management Webservices and VMware vSphere Profile-Driven Storage Service. "Important: Enter the password carefully. The Certificate Automation Update Tool does not check the validity of the vCenter Server database password." "A blank or incorrect password will leave the system in an inconsistent state, which will cause the vCenter Server to become unavailable. " "If the system becomes unstable due to a bad password, see the Troubleshooting Section of KB 2041600." ash (SHA-1). In a secure environment it is recommended to use SHA2-256 or a stronger hash algorithm. [.] The supplied certificate chain is valid. "Restarting services... (This can take some time)"
"Starting vCenter Server and other services..."
[Thu 28/05/2015 - 10:45:42.32]: Last operation update vCenter Server SSL certificate completed successfully. [Thu 28/05/2015 - 10:45:42.33]: Go to the next step in the plan that was received from Update Steps Planner. Once you’ve had your way with vCenter, etc, you can do your ESXi hosts. The following link has info on that – Configuring CA signed certificates for ESXi 5.x hosts, and you can grab the appropriate version of Win32 OpenSSL from here. Here’s what it looks like when you use OpenSSL to generate the requests for your ESXi hosts. Copyright (c) 2009 Microsoft Corporation. All rights reserved. Updates In some of my previous posts, I talked about a few things that I had to do to get things working. In this post, I discussed the “Missing VMware Tools ISO”. I still don’t know why the tools files were missing from the installation, but I do know that once we applied some more recent vSphere Update Manager baselines to those hosts the correct ISO files were added to the hosts. I also covered “HP Legacy BIOS Mode and ESXi” in this post. Interestingly, you’ll need to change back to UEFI BIOS mode if you’re trying to make VirtualConnect changes to a host, as my client found out the hard way. I also spoke about ESXi hosts and Active Directory authentication in this post. I should point out that this post by Joseph also came in handy. If you find that when you restart the services on the host it bombs out, you’ll need to manually create /var/lock/subsys. There’s a KB article from VMware that says the same thing here. And you should then be right. I’ve been covering a few workarounds, mishaps and random things I’ve had to do during a recent vSphere 5.5 U2 deployment. This is Part 4 in the series, and I hope some of it is useful. You can read my other posts here, here, and here. Love it or hate it, the vSphere Web Client is here to stay. If, for some reason, you’re logged into a host with credentials that you want to use to log in to your vSphere environment with, you can use pass-through authentication if you install the Client Integration Plug-in for vSphere Web Client. You can get details on how to do that here. “Call “HostProfileManager.GenerateConfigTaskList” for object “HostProfileManager” on vCenter Server “hostname.domain” failed. I did some searching and chanced upon this article BL460c Gen9 + ESXi 5.5 – Special procedure when using UEFI? Seems that setting the host’s Boot Mode to Legacy BIOS Mode makes for a happier installation and on-going experience. The guy who installed the blades had set them to Legacy mode for the installation and then set them back to UEFI. I can’t tell you why this needed to occur, nor can I tell you the disadvantages of taking this approach. 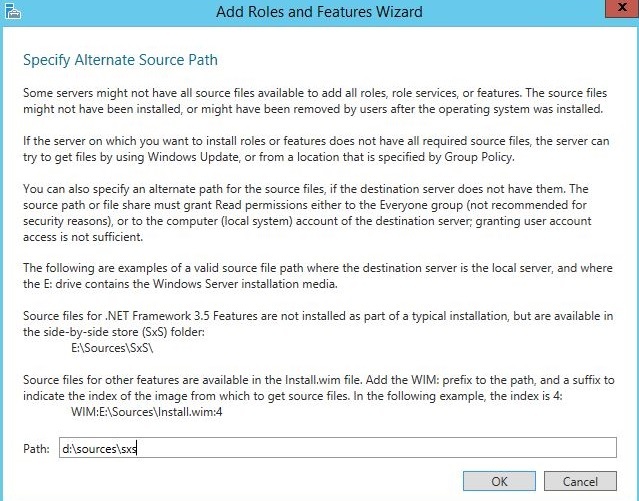 If you’re running your VMware applications on Windows 2012 R2, there’s a chance you’ll need to install .Net 3.5 on your guest to get things working. This is handled via Server Roles. Microsoft has a TechNet article on how to do it here. Note that you’ll need your Windows installation media, and you’ll likely need to specify an alternate source – %CDROM%\sources\sxs. I’m very excited and humbled to have been listed as a vExpert for 2015. This is the third year in a row that they’ve forgotten to delete my name off the list (BTW I’ll never get tired of that joke). The announcement and list is here, and I expect more news about this year’s programme soon. Thanks again to Corey Romero and the rest of the VMware Social people for making this kind of thing happen. And thanks also to the vExpert community for being, well, such a neat (and growing) community to be part of.